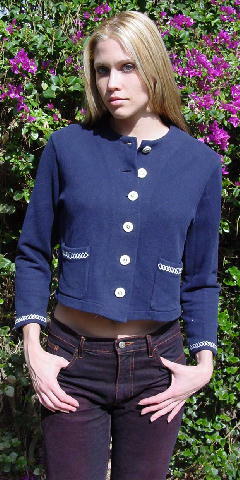 This vintage navy blue jacket has white embroidery accents on the two front lower pockets and at the end of the long sleeves. It has six antique white buttons with silver textured accents and edging. 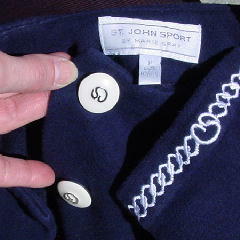 There is no fabric content tag, but it's very, very soft to the touch. It fits a person as small as a size 6. It's from a Canadian model, who sold it because she needed the money.